Under this role, Jesus is driving the strategy, management and profitability of ad operations, content marketing, strategic brand partnerships and network platforms. 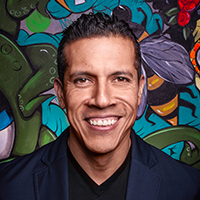 Prior to this, Jesus spent almost 9 years with Univision in multiple senior leadership roles where he ran digital operations and strategy for the Univision Television Group (UTG) and previously the Local Interactive Media Group. Under his leadership the UTG digital group achieved profitability. He also successfully led the expansion of the local digital business for the Radio and TV groups, re-launched 70 online and mobile sites in a seven-month period as well as the first Univision music branded app. Jesus’ background is in IT consulting and engineering. He is a board member of the Digital Advisory Council supporting the St. Jude Children Research Hospital and holds an MBA from the UCLA Anderson School of Management and a BS in Mechanical Engineering from UCSB.